Polycythemia refers to an increased hemoglobin concentration and/or hematocrit in peripheral blood. 1)Elevation of Hgb and/or Hct due to a decrease in plasma volume alone (ie, without an increase of the RBC mass) is referred to as relative polycythemia. 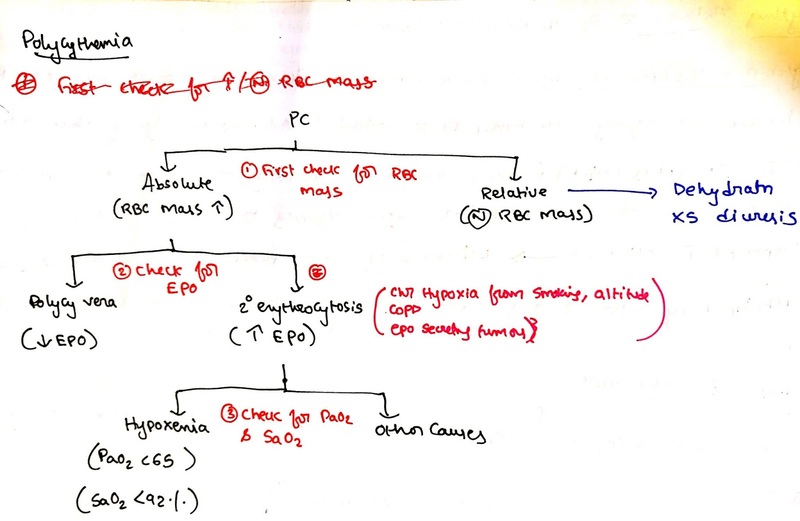 2)An increase of RBC mass refers to Absolute polycythemia. It can be categorized as either primary or secondary polycythemia. 1)If PaO2<65% and SaO2<92% then it is because of chronic hypoxia due to high altitude, COPD, Smoking, etc. 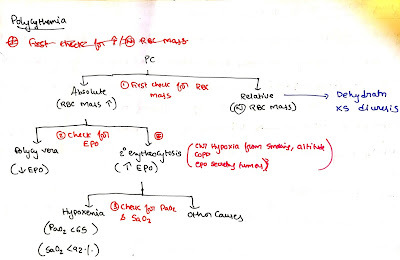 2)If PaO2 and SaO2 levels are normal then consider EPO-secreting tumor(renal cell carcinoma, pheochromocytoma).